The Model 9116 multifunctional Isocentric Beam Checker II (IBC II) is a precision quality assurance tool for daily, weekly or monthly quality assessments of all mechanical and geometrical treatment parameters of linear accelerators or teletherapy units. The IBC II is designed to easily and accurately check collimator isocentricity, gantry isocentricity, table isocentricity, collimator field size accuracy, radiation/ light field congruence, isocenter rotational stability, ODI accuracy and laser light alignments. It consists of a large, opaque acrylic screen backed by a secondary plate, both supported by an acrylic base and side supports. The screen is inscribed with lines precisely defining the corners, edges and center of the screen’s 2 x 2cm, 5 x 5cm, 10 x 10cm, 15 x 15cm and 20 x 20cm fields. Intersecting center lines are inscribed with short lines spaced 1cm apart. The screen can rotate about its axis in increments of 45-degrees. Tungsten markers of 2mm diameter are embedded in the center and corners of each field. A 10′ x 12′ ready-packed film can be sandwiched between the two plates. When exposed, the tungsten markers project a sharp image on the film eliminating inaccuracy and the need of pricking holes into the film. To rotate the screen, simply hold both the left and right knobs together while turning them simultaneously. When turned 45-degrees, the screen seats itself accurately and automatically; thus, repositioning is accomplished easily and quickly. The base features non-slip 3-point leveling pads and a bubble level, allowing it to be set up for use quickly and conveniently. The Isocentric Beam Checker II is shipped fully assembled. Precision radiation therapy requires treatment geometry that is accurate and reproducible. Since machine geometry can easily become misaligned, it should be checked frequently. The Tel-Align™ permits a quick check of these parameters and facilitates the adjustment of those which require realignment. It is especially useful in an overall QA program. The device consists of a rectangular plastic base, 17.5cm x 14cm x 1cm thick, with a removable vertical scale, 18cm high. The upper surface of the base has lead markers that form a square (10 x 10cm) for visualization on film. A cross hair in the centre of the square lines up with two additional sets of cross hairs, one on each outer edge of the base. The Tel-Align™ is easy to use. the machine field size (10 x 10cm) has been set, the table height is adjusted until the base surface is at the isocenter distance. The collimator rotation angle is set at 0-degrees. When positioned properly, the edges of the light field should coincide with the inscribed square. The field center should intersect the center cross hair and the side lights should agree with the corresponding cross hairs at the edges of the base. The vertical scale is placed on the base to check the optical distance indicator, or a film can be placed under the base to check the light field versus the radiation field. By rotating the gantry angle at ±90°, the isocenter variation and optical back pointer are also checked. If adjustment of the machine geometry is needed, it can be done readily with the Tel-Align™ in place. The Model LAD-4 is an improved CNMC designer Laser Alignment Device for the test and alignment of isocenter beams. It allows for adjustments to be made by one person. One set-up permits alignment of side, overhead and sagittal lasers and it is usable on dot or line lasers. The materials for the LAD-4 have been chosen for improved ruggedness. It is precision made of acrylic. White surfaces are laminated and the lines are precision engraved, eliminating paint chippings and jagged lines associated with other designs. (2" x 2" x 2.25") and weighs 95 grams. Nonius is a solid state measurement instrument designed to verify the coincidence between the light and radiation fields of various types of X-ray equipment. With the advent of digital radiography, traditional methods for light field and radiation field congruence measurements using X-ray film are becoming less available. Nonius solves this problem by transferring measured data to a PC in real time where the results are automatically analyzed and displayed. Measured data are automatically saved and can be accessed at a later point in time for evaluation purposes. The software also provides a protocol function including hardcopy print-out. In addition, Nonius provides the option to assess the position and width as well as the dose profile of fanned X-ray beams. The technology used to develop Nonius is highly flexible, allowing it to be used in digital as well as conventional X-ray measurements with a resolution of 0.01 mm. The Nonius is equipped with a USB cable and comes with associated software. 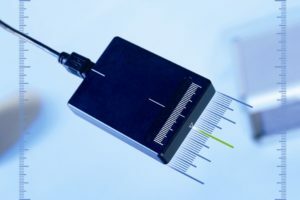 The precision Isocentric Beam Checker I consists of a screen holder and a removable screen with tungsten markers that precisely define the corners, edges and center of the screen’s 2 x 2cm, 5 x 5cm and 10 x 10cm fields. The screen holder has a bubble level, three thumbwheel-adjustable legs and a knob that rotates the screen ±360° in 15° increments. By placing and leveling the Isocentric Beam Checker I at the assumed isocenter, one can easily check the accuracy of the collimator field size indicators as well as the isocenter rotational stability, backpointer alignment and patient positioning lights. 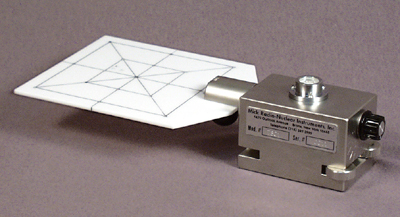 The screen can then be removed and placed on a sheet of "pre-packed" film for radiation and light field congruence testing. 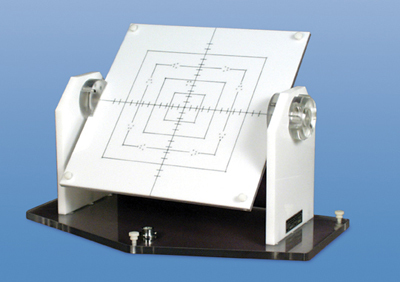 The Tungsten Rotating Alignment Pattern checks radiation and light field congruence and size, laser alignment and gantry, collimator and table isocentricity. Embedded 1mm diameter tungsten rods and tungsten-filled lines are used to give a sharper image on films. Square line patterns are visible for 10 x 10cm and 20 x 20cm fields. The Beam Sentry 2, Model 105A, provides a convenient and economical means of performing daily radiation output constancy checks. It is a lightweight, portable unit with remote readout featuring the accuracy of a digital display. 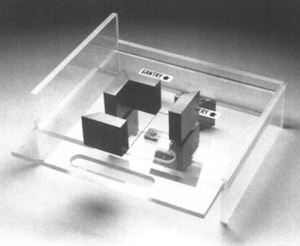 The unique design, featuring a separate ion chamber, eliminates radiation damage to the electronics while allowing both the dosimeter and the ion chamber to be used independently for other purposes. The Beam Sentry 2 is easy to use. Simply connect the electrometer to the ion chamber assembly, place the electrometer at the foot of the treatment table, collimate the beam to the 10cm field markings on the ion chamber, make the exposure and collect the reading. 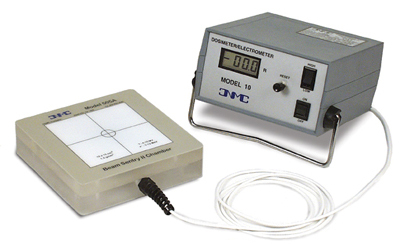 The electrometer offers high accuracy, precision and repeatability and is suitable as a stand-by or back-up dosimeter. The connectors are triaxial BNC, permitted use with a standard triaxial extension cable for reading successive doses from outside of the treatment room and providing interchangeablility with other dosimetry ion chambers and electrometers. The model 505A detector assembly contains a sealed plane-parallel ion chamber, requiring no corrections for barometric pressure and temperature changes. The detector assembly is reversible, having two entrance windows, each with a 10cm field marking. One entrance window has a build-up optimized for 6MV and electrons beams while the opposite entrance window has a build-up optimized for 18MV. The Beam Sentry 2, Model 115A, is essentially identical to the Model 105A in concept. It consists of a Model 105A sealed ion chamber assembly and a Model 1100 full-capabilitiy, calibration-grade electrometer. The Model 430 beam alignment test tool quickly and simply detects any misalignment, while the Model 431 arm punch test tool identifies the cause of misalignment. The tools can be used separately, but together they make up a very useful test kit. Testing the beam alignment of isocentric units (Co-60, linear accelerators, and therapy simulators) should be done on a weekly basis. The arm punch test tool is used after a problem has been detected with the beam alignment test tool. It will diagnose radiation source displacement, asymmetric collimator jaws, nonintersecting collimator and gantry axes, and a sagging gantry arm. When ordering, specify if for Siemens or Varian accelerator. This system will calibrate all optical distance indicators on accelerators. 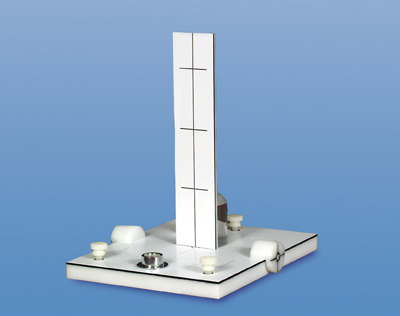 The ball pointer is used to determine the rotational isocenter of the treatment machine collimator head and gantry. The ballpointer is also visible in fluoroscopy on simulators. Correct alignment of the light field with the radiation field is vital for reliable treatment setup. Using the X-Lite, the check is performed with more convenience than ever, using no film, no cables and no connectors. 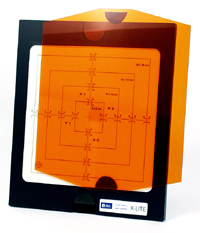 The X-Lite is a fluorescent plate for visualizing the accelerator radiation field directly on the treatment table. The plate is activated by ionizing radiation, producing a green fluorescence which is clearly visible and lasts for a few minutes after the radiation ceases to allow sufficient time to examine the coincidence of radiation field to the collimated light field. The 23 x 23 cm active area is permanently marked with 5 x 5, 10 x 10, 15 x 15 and 20 x 20 field scales in centimeters. A protective orange filter prevents undesired activation of the phosphor by the light field from the gantry head or by ambient lighting. Irradiation photons and electrons penetrate the filter to activate the phosphor within the plate. Using the X-Lite is easy, and alignment checks can become a part of the daily QA routine. With the filter in place, the light field is collimated to the scale on the X-Lite. Any build-up material is added on top of the plate and the exposure is made. Upon irradiation, the light filter is removed and the fluorescence of the X-Lite is checked for radiation field alignment. It is not necessary to wait for the afterglow to fade between irradiations, since the contrast is high as long as the following dose is the same or higher. The radiation beam should coincide with the light field to within ±2mm on each side at the normal SSD. The TheraPro is designed for daily output, symmetry, flatness and energy checks of radiation therapy treatment machines. High quality, ease-of-use and versatility are the prime objectives in the TheraPro design. A Windows-based control panel digitally controls the instrument. The TheraPro guides the user through setup, measurement and data management. The user proceeds through measurement sequences easily by using either the touchscreen interface or by clicking the mouse. 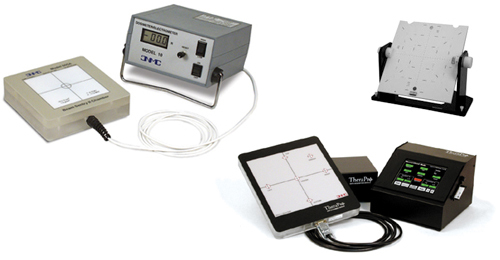 The TheraPro stores a virtually-unlimited number of calibrations and measurements. Years of measurements can be stored on multiple machines using the internal 32MB flash memory. Stored beam information includes data, time, machine name, energy, chamber readings, flatness and symmetry. Data files can be transferred via the supplier 64MB CompactFlash™ card and USB card reader to standard spreadsheet or word processor applications. When compared to similar devices, the TheraPro is unique because it is expandable. With the optional Diode Dosimetry Software, diode input module and diode detectors, the TheraPro can be economically upgraded to perform as a five-channel diode dosimeter with the same data collection and storage power as mentioned above. As such, the TheraPro does not sit idle after the daily beam output checks are done. perfect correlation between simulation and beam. rapidly and accurately check the laser beam alignment through the iso-centre of the machine (accelerator, cobalt, simulator). emphasize the match between the luminous simulation and irradiating beam. improve control over the treatment quality assurance. a base plate, 10cm thick, resting on 3 adjustable legs all made from DELRIN material. 2 vertical metallic fixtures holding a 3 position rotation plate (90°, 0° & 270°). 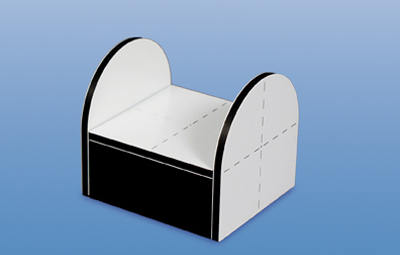 It is endowed with a slot that allows slippage of a radiological film (24 x 30 cm). This plate is pierced with holes that allow punching and marking of the film, thus materializing square fields (5 x 5 cm, 10 x 10 cm, 20 x 20 cm) on the negative film. 1 bubble leveller embedded into the tilting plate, which allows a perfect horizontal evening out. 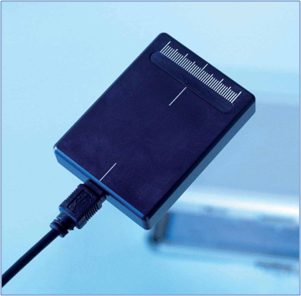 The Nonius is an easy-to-use but very sophisticated measuring instrument to verify size and quality of X-ray fields. It can also be used to analyse the properties of fanned X-ray beams. The Nonius can be used to verify if the light visor matches the actual X-ray field. In addition, the nonius provides the option to assess the position and width as well as the dose profile of fanned X-ray beams. The measurement accuracy is +/- 0.1 mm! Connect the device via USB to a Laptop or Tablet PC. Position the head unit at the respective position. Use light field or a reference point for positioning. Data is transferred to the PC in real time where the result is displayed and visualised. All results are automatically saved and can be loaded into the software at a later point of time for evaluation purposes. The software also provides a protocol function including hardcopy print-out. The Nonius is equipped with a USB cable and comes with associated software in a compact carrying case. It can be hooked up to any Laptop or Tablet PC with a Windows® Op System. To position the device fast and reliably (also in vertical position), the optional Bridge Holder is available.